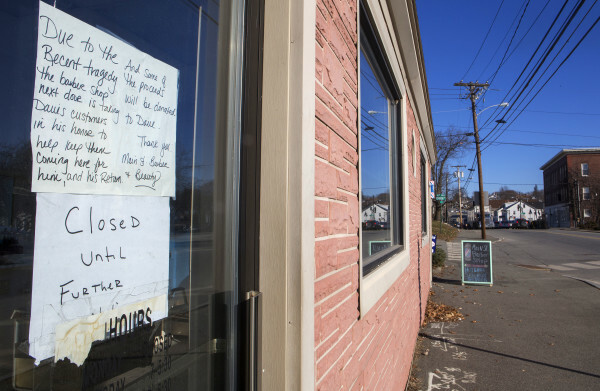 A note from Main St. Barber and Beauty is seen Wednesday on the door of Dave's Barber Shop in Brewer along with a closed sign. David Grant died Monday from injuries after being struck by a vehicle while walking to work on the morning of Dec. 20. BREWER, Maine — A well-known Brewer barber who was struck and killed by a car in December while walking in a crosswalk in front of his business is the last recorded pedestrian death in Maine for 2014. Because one of every four people hit by cars every year in Maine is hit in a crosswalk, Sen. Amy Volk, R-Scarborough, submitted a bill sponsored by the Bicycle Coalition of Maine to strengthen the law by making drivers stop, group spokesman Brian Allenby said recently. Currently, drivers “must yield the right-of-way to a pedestrian crossing within a marked crosswalk,” according to state law. Drivers must give pedestrians walking on the street at least 3 feet of clearance when passing, just like bicyclists. “A car always has to yield to a pedestrian in a crosswalk but it’s not like you can just cross against the light,” Bangor police Sgt. Wade Betters said Sunday. Pedestrian crosswalk lights are installed at busy intersections to show walkers when it is safe. Each collision in a crosswalk is evaluated on a case-by-case basis and police have found that if a pedestrian is hit in a crosswalk, “some fault may lie on the person [walking],” Betters said. If the bill passes into law, drivers will need to come to a complete stop at any pedestrian-occupied crosswalk and remain stopped until the person has completely crossed the roadway. Under current law, drivers do not need to come to a complete stop when allowing pedestrians to pass at a crosswalk if they deem it isn’t necessary, such as when the person on foot has passed beyond the vehicle. “Once you signal intention to cross and or begin to cross, cars will be required to stop. It won’t be up to their own judgment of how fast they are moving, how fast you are moving, what the road conditions or other conditions are,” Allenby said. Additionally, “this law will make enforcement in this scenario much more straightforward, as identifying a violation of a requirement to ‘stop’ is immensely easier than doing the same for a requirement to ‘yield,’” he said. Even though motorists must yield to people in crosswalks, it’s still important for pedestrians to look both ways and only proceed forward when it’s safe, Allenby said. The proposed bill also clarifies the responsibilities of bicyclists and defines vulnerable users as anyone on a roadway who is not in a vehicle, including pedestrians, wheelchair users, bicyclists, construction workers, farm workers, even motorcyclists. More than 250 pedestrians are hit by cars every year in Maine, according to the Maine Department of Transportation, and more than 25 percent of those collisions occurred when the person was crossing the street in a marked crosswalk or crossing with the signal at an intersection. Last year, eight pedestrians died on Maine roads, a decrease from the 11 who perished in 2013 and nine in 2012, according to James Tanner, fatal accident system analyst for the Bureau of Highway Safety. While the number of bicycle fatalities changes from year to year, “Maine averages two bicycle-related crash fatalities each year,” Tanner said. There were two in 2014, a decrease from four in 2013. One was recorded in 2012, zero in 2011, one in 2010 and four in 2009, Tanner said. The bill proposed by Volk, who served two terms as a state representative and is in her first term as a state senator, also addresses concerns raised by law enforcement about the lack of penalties for people on bicycles who break the law. Vulnerable users are defined in the bill as people who are not in an enclosed vehicle.